The Village of Palmetto Bay was incorporated on September 10, 2002 and is located between US-1 and Biscayne Bay, south of Southwest 136th street to north of Southwest 184th street. Palmetto Bay offers unique recreational activities and access to the bay. The community is also known as “The Village of Parks” with 6 park facilities as well as the preservation of the natural environment. Coral Reef Park in the Village of Palmetto Bay is more than 50 acres with green open spaces and pineland preserve areas. It is the perfect location for playing, exercising, relaxing, having a picnic and enjoying the peaceful flowing canal in Palmetto Bay. Deering Estate at Cutler is a 444-acre estate on the East side of Old Cutler Road with globally endangered pine rockland habitat, as well as a habitat for rare and native plants such as orchids, bromeliads, and 40 species of trees. The Estate serves as an outdoor classroom and laboratory for students and scientists. Deering Estate offers guided tours, as well as eco-adventure tours which are limited and available by registering with the ticket office at the estate. These eco-adventure tours are biking, kayaking and canoeing with a guide to explore the nature in Deering Estate and the bay. The estate also offers lectures, community classes, and rental facilities for social events like corporate parties and weddings. The social events can be held in the library, ballroom or court yard. Palmetto Bay has excellent public schools, all of which have annually earned the grade “A” under the State of Florida’s A+ Plan, as well as exceptional private schools. Coral Reef Elementary is an A-rated public school that provides academic education for grades PK-5. 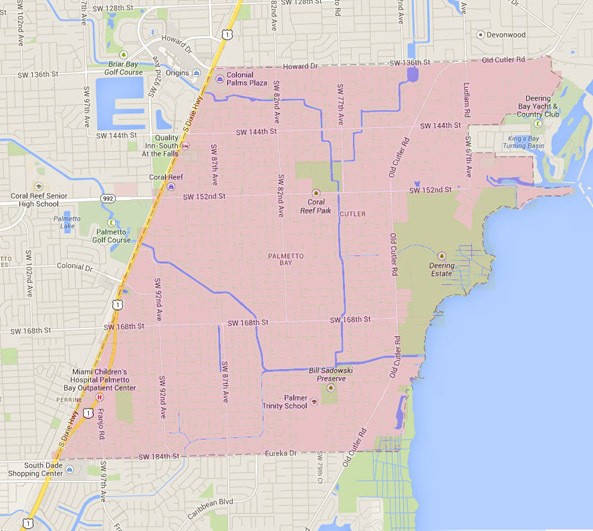 Howard Drive Elementary, Perrine Elementary, Southwood Middle School, Miami Palmetto Senior High School, and Coral Reef Senior High School are all public schools for students living within the Village of Palmetto Bay. The local private schools include Westminster Christian School, Palmer Trinity, Christ Fellowship Academy, Alexander Montessori, Winhold Montessori, and Holy Rosary-St. Richard Catholic School. The Village of Palmetto Bay is a tranquil community, family friendly and ideal for anyone that enjoys the preservation of the natural environment this tropical city has to offer. If you have any interest living in The Village of Palmetto Bay, contact us and we will assist you with your real estate needs.